From October 1942 Jews from Western Europe – Austria, Germany and from April 1943 also Jews from Holland and Denmark – were deported to Theresienstadt. The leading personalities of Czech Jewry, headed by Jacob Edelstein, supported the conception of establishing a ghetto within the territory of the “Protectorate Bohemia and Moravia” as an alternative to deportations to the East. They hoped that this ghetto would provide a kind of shelter for Jews in the coming hard times. This illusion was shattered with the start of transports to the East in January 1942 and with the execution of 16 Jewish prisoners for smuggling out letters or buying a cake. For about 4 months there was an action to “beautify” the ghetto in preparation for a visit of representatives of the International Red Cross, in June 23rd, 1944. At the same time transports to the East continued to leave the ghetto, at an accelerated pace. The ghetto existed until liberation in May 1945. 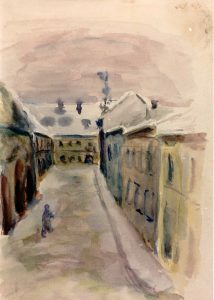 Out of 160,000 prisoners from Czechoslovakia, Germany, Austria, Holland, Denmark and other countries that passed through Theresienstadt between 1941 and 1945, 35,409 died in the ghetto from hunger or disease. 88,129 were deported from there to extermination camps and out of these 4,136 survived. Of the 12,171 Jewish Children born 1928-1945 and sent to Ghetto Theresienstadt – whose future was uppermost on the mind of the Jewish leadership – 9,001 were deported to extermination camps in the East, of whom 325 children survived.